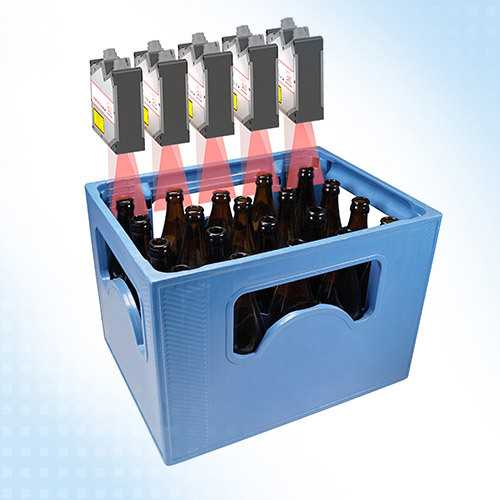 Laser scanners from Micro-Epsilon are used for high speed and fully automatic inspection of empty containers at bottlers and breweries. For this application, the Micro-Epsilon agent Tipteh has designed a test system based on laser line triangulation, which is used when the bottle crates are received. This inline system is equipped with five scanCONTROL 2900-50 laser line triangulation sensors from Micro-Epsilon. The crates are conveyed on a belt and scanned from above. Each scanner measures a row of bottles in the crates. Presence monitoring is carried out at conveyor speeds of up to 850 mm/s. The scanner uses the respective bottle height to determine whether the correct type of bottle is in the crate. The bottle height must not deviate more than 3 mm from the target height of the respective bottle type.